We just finished a three year project in which we developed a series of mensurative and manipulative experiments on different sites along the Central-Northern Coast of Chile. Study sites on the project where selected under different parameters such as open access areas (meaning that anyone can go and get fish and seafood) and protected areas called areas of management and exploitation of benthic resources (AMEBRs) where there are fishermen who care for benthic resources and only they can catch them. To measure the state of kelp forest and the relationship between the brown seaweed and fish, 4 scientific divers with various tasks recorded and monitored kelp forests of these sites twice a year for three years. The results obtained by these divers were very interesting, the AMERBs sites have more adult and juvenile brown macroalgae per unit of area, and adult plants are larger, because they have more foliage. At these sites there is also a greater number and biomass of fish, all in comparison with the forest of brown macroalgae of free access sites for fisheries. Free access sites had a higher number of grazers like sea urchins and snails and small herbivores that eat brown macroalgae. To evaluate these results in field, experiments where set up to estimate the growth of the blades of brown macroalgae Lessonia trabeculata (see figure 1a) in the presence and absence of herbivorous snails measuring over months. The seaweed in the presence of this snail not only stopped growing, but also declined (see figure 1b). The next step was to experiment in the laboratory the feeding behavior of the herbivores in the presence and absence of potential predators (fish) for this aquarium with herbivores and macroalgal tissues were used. The experiment showed that snails fed less in the presence of fish. The mere presence of fish caused snails to climb to the top of the aquarium and spend more time there. Then it was confirmed that fish generate indirect positive effects on the brown macro algae. Other positive direct effects of fish on brown macroalgae were also evaluated. In the laboratory, it was confirmed that in the presence of fish and filter feeders such as mussels, macroalgae are kept in better condition. They do not lose their blades (leaves) and grow faster than seaweed that only had the presence of filter feeders. The nutrients that fish generate as particulate organic material are dissolved by the filtering procedure of mussel then are used by macroalgae. It turned out that the seaweed benefits from the nutrients provided by the fish and accelerate their growth. Figure showing the experiments herbivory on reproductive tissue of the kelp Lessonia tabeculata by the herbivore “jerguilla”, Aplodactylus punctatus: a) experimental mesocosms; b) delivered algae as food; c) indicates consumption and bites by adults jerguillas. Photos from Catalina Ruz. The brown macroalgae generate different services to the fish species, providing habitat for early stages of fish and food indirectly (many fish feed on small crustaceans such as amphipods, gastropods, isopods inhabiting kelp) and directly, as their own tissues are food for herbivorous fish. Herbivorous fish can consume algal reproductive tissues. In these tissues spores live; spores are the seeds of macroalgae. 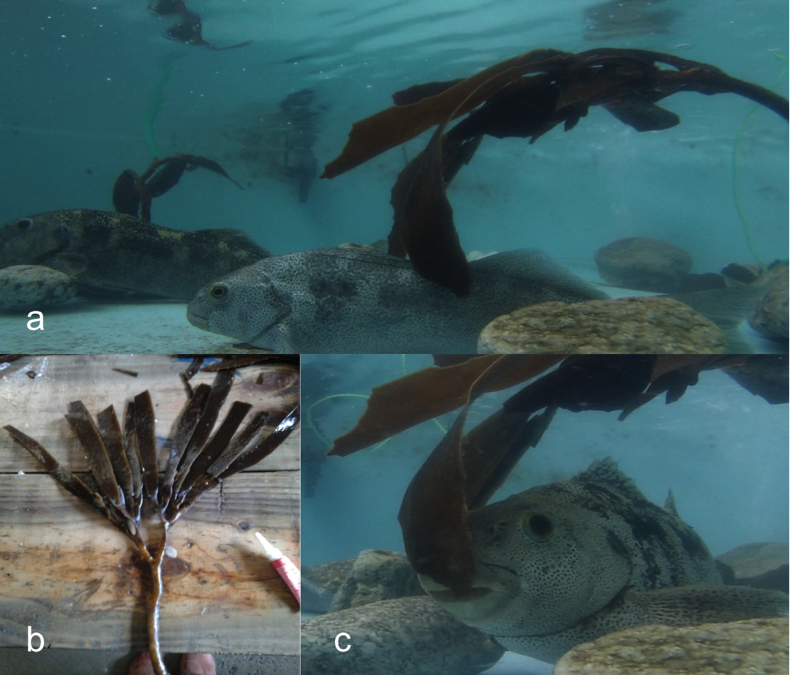 We found that these reproductive tissues that were consumed by fish herbivores may reduce the epiphytic (seaweed on tissues) and chemical load that are produced in these tissues (to deters small herbivores). The seeds of the algae can be released more quickly once passes through the digestive tract of fish and may supply more nutrients for growth. We also found that the seeds are viable and germinated with the same speed as those of reproductive tissue control. Herbivorous fish can be vehicles that disperse seeds macroalgae as these spores have very little mobility (see the photos of the experiments). This research project may generate different conclusions. One is that as the brown macroalgae are important habitat and food for fish species. The fish in turn provide benefits to macroalgae. The importance of fish is notorious and is expressed at different spatial scales (1 m to km) where the presence of fish and other agents can modify the landscape. We can conclude that in the absence of fish, macroalgae lose their condition (assessed as foliage and growth), which could bring significant consequences for artisanal and recreational fishing. Also, there are no management plans in Chile led to the fish. Considering the importance of these coastal environments, consequences will be negative to kelp ecosystems if limitations for catching reef fish in Chile do not apply.